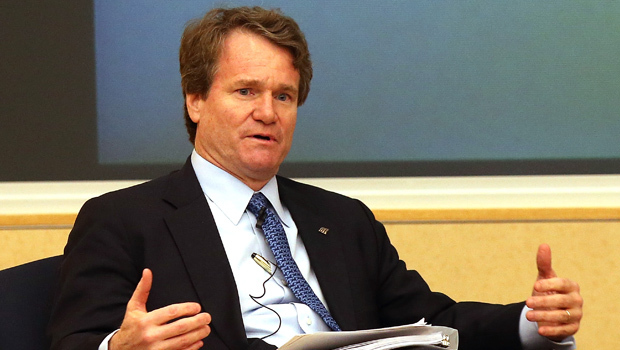 Bank of America (BAC) says chief executive Brian Moynihan received a 2012 compensation package worth $7.4 million, down slightly from the prior year, according to an Associated Press analysis of a regulatory document filed Thursday. He collected about $7.5 million in 2011. Moynihan became CEO at the start of 2010, after his predecessor Ken Lewis stepped down amid controversy over the acquisitions of Merrill Lynch and Countrywide. Moynihan has been slimming down the bank's operations, including the sale of its international global wealth investment management business and improving its balance sheet last year. Bank of America paid Moynihan a salary of $950,000 and no bonus for 2012, both the same as in 2011. He was given stock awards last year valued at $5.9 million, down from $6.1 million. He also received $520,513 in perks like use of corporate aircraft and secured parking. The pay package also includes nearly $40,000 in above-market returns tied to a deferred compensation plan. While the bank did not increase any of its top executive's salaries in 2012, it noted in a filing with the Securities and Exchange Commission Thursday that beginning in February, Moynihan's base salary increased to $1.5 million, along with raises for other top executives. Bank of America said the increases reflect market trends, improving financial performance and resolution of several legacy issues the bank faced.